In the waters off Mexico’s Caribbean coast, an insurance giant is about to test a new line of business, one designed to outperform governments in preparing for climate change—and create a fresh source of revenue. As climate change progresses, so does the risk from hurricanes, flooding, and other natural disasters. Repairing the damage caused by these events has strained government budgets. Between 2005 and 2014, for example, the U.S. spent at least $278 billion on disaster assistance. The U.S. Government Accountability Office counts climate change as one of the most significant financial risks to the federal government. 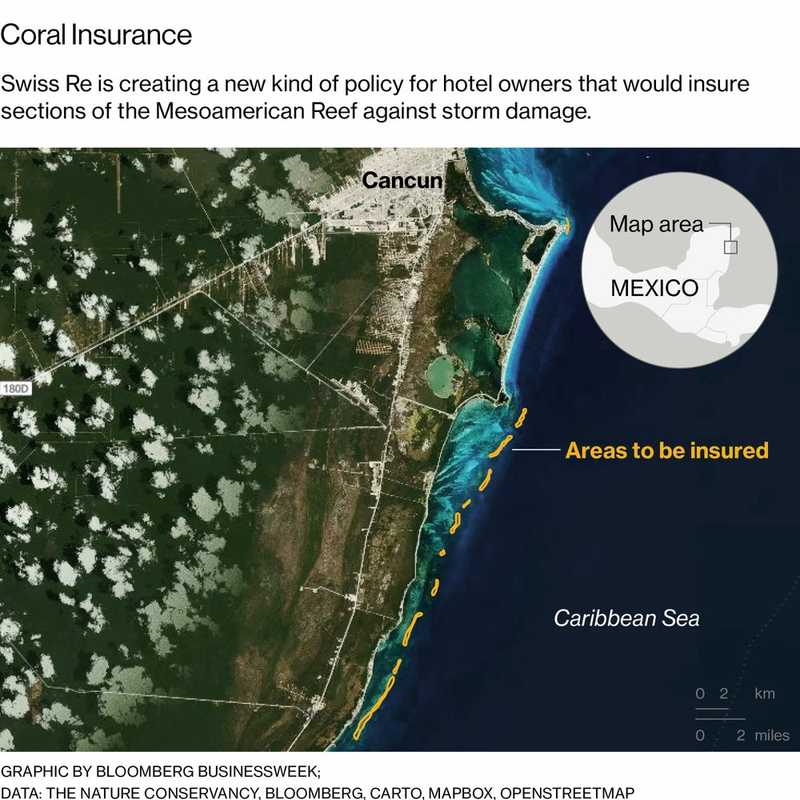 The setting for Swiss Re’s experiment is the Mayan Riviera, where pristine beaches from Cancún to Tulum are increasingly exposed to extreme storms, threatening a multibillion-dollar tourism economy. The reef, the largest in the Western Hemisphere, runs south for some 700 miles from the tip of the Yucatán Peninsula. Its corals blunt the force of storms—and it’s in need of continued repairs, such as reattaching broken-off corals or elevating the reef with man-made structures. The Nature Conservancy, a U.S. environmental group, estimates that for every meter of height the reef loses, the potential economic damage from a major hurricane triples. After Hurricane Wilma struck in 2005, causing $7.5 billion of damage in Mexico, beachfront hotel owners began paying extra taxes to the state government to handle beach restoration and protect the reef. The owners are skeptical of the usefulness of those payments. “Where it’s going is anybody’s guess,” says Miguel Angel Diego, who sits on the board of the association that represents hotels in the area. The Nature Conservancy has proposed a different approach: The extra money paid by the hotel owners to the government could be converted into premium payments to Swiss Re to cover the reef. The policy would be what’s called parametric insurance, in which a large hurricane would trigger near-immediate payouts. By having the money arrive quickly, reef repairs could begin sooner. Fast action is crucial for repairing corals broken off during a hurricane, according to María del Carmen García Rivas, director for the national park that encompasses the reef. “If you cut any place of your body, and you have attention very quickly, you have more possibility for getting healthy. It’s the same with the reef,” she says. But she said the government can’t provide funds quickly enough, which is why private insurance is appealing. Another benefit: Insurance gives hotel owners one more reason to help keep the reef healthy enough to continue blunting the force of storms. If they don’t, “they’re going to pay for it” with higher insurance costs, says Kaplan. The approach planned in Mexico can be expanded to other countries, says Kathy Baughman McLeod, the Nature Conservancy’s managing director for coastal risk and investment. She says at least 26 countries around the world are both protected by and economically dependent on coral reefs. The model could also be used for other publicly owned features that shield coastlines from storms, such as mangrove forests and coastal wetlands. The Nature Conservancy was one of the sponsors of a July conference of the International Insurance Society in London, which focused on the potential for insurers to augment governments in protecting against extreme weather. BOTTOM LINE - Swiss Re wants to insure the reefs that shield coastlines, charging premiums to the people those natural structures protect. Whatever it takes! We need to protect our coral reefs. When destructed, it takes 10 years to fully come back to life.